For me here in the NE of Scotland the kids go back to school tomorrow after their summer holiday (6 week break). Phew! I have to admit I have been a lazy sod over the last 2 months mainly servicing & maintaining instead of doing anything new or productive of note. So I will be getting back into it and looking to get more productive from this week onwards, only a couple of small points to note/share today. I found Trendhunter last week, the internet is a big place and I get the feeling when I stumble across a useful website like Trendhunter that everyone else must already know about it, if your looking for inspiration rather than look what is already popular it can pay to get ahead of the game with ideas of what will be popular in the future. So check out these top sites for trend hunting. I had been suffering from mouse rsi last month quite badly, this was really starting to put paid to any small attempt at productivity as the pain in my right hand meant I was constantly taking breaks and with the kids on holiday my wife would suggest afternoon outings etc and I’d jump at the chance of relief. I decided upon the Evoluent 3 vertical mouse, it looks strange but the theory is that your hand is in a handshake position which is more natural than the constant twisting of the forearm when using a traditional mouse. It was a bit pricey for me in the UK as it was shipped in from the USA. $59 for the mouse and $36 shipping. It does feel strange at first and even after the 3rd/4th day I wasn’t sure if it was helping me at all. After the first full week though all pain in my hand had gone and now after using it for a few weeks I can fully recommend it to anyone, it feels natural, comfortable and responsive with lots of settings and my rsi pain has all gone, not a business tip but I am 100% sure it will help me be more productive in the coming months as I can concentrate better. There are still many gems out there in the property developing online world, all you need is a credit card and some time and you could be running a decent online business within a month with little to zero previous experience. The time is now though as they are becoming harder to find, if you don’t want to go down the prolonged route of building a large authority site from scratch then get yourself a budget/bankroll or a credit card and let Google find you a bargain. I found a decent one last week but can’t mention it for now until all the paperwork is done and the site is transferred, hopefully within the next fortnight I can disclose it and how I found it. Oh and my keyboard packed up this morning making today’s post much more challenging so I managed to find an old one in the cupboard, but the ‘Enter’ button in tiny 🙁 and I can’t get to grips with it at all. Can’t suffer 2-3 days of this if I buy one from Ebay so I’m off out this afternoon to buy a replacement. Web browsing can be really nasty on the old mouse hand, so sorry to hear it’s effecting you but good to hear a solution has been found. I wrote about the Vertical mouse a while back on CG, I never actually used one though so if you fancy doing a review, (especially if it has an affiliate program 🙂 ), where did you get it from? I bought mine on Ebay, about the same price as an online UK retailer overall, haven’t seen an aff but if you found one for CG I’d do a free review for you Al – highly recommended. I havent suffered pains for a few years now when using a mouse, but I do switch between hands every few minutes when browsing. When needing to type I use the mouse in my right hand and when just scrolling around I switch to my left hand on the mouse. No idea why, but I just do. LOL. I am having more back problems now than wrist problems. I need to get a different desk and put my monitor just below the level of my head instead of just above it. Thanks for the reminder about bargains. I just have to keep looking. I have the same problem with my desk being quite high and it causing problems. I used to use one of those gel pads to rest my wrist on while using the mouse, but I found that just gave me a really bad pain in my wrist. I tried a gel wrist pad but it also gave me more pain. ‘Persons’ Mike as there are 2 of us, if you wanted to prepare and then submit questions to either of us I am sure both of us would take the time to answer them. Thanks for the tip about the mouse. I also had pain in my right wrist but now I use mostly left hand. It takes about a week to get used to. 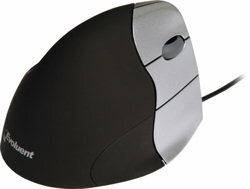 I use a vertical mouse too, my choice was the AirO2bic Quill Mouse and it has helped me a lot to. I don’t think it is expensive to equip yourself with something that won’t hurt you. I also have one for each side as I also use my left wrist when my right gets sore and vs. My keyboard is also vertical. Hopefully vertical devices will be mainstream soon to prevent a lot of people from getting CTS or RSI pain. I used to have terrible RSI, and then started using a 3M vertical mouse. It looks funny (like a joystick), but once you get the hang of it it makes so much more sense. It basically means you use your shoulder to move the mouse around instead of your wrist, so you’re not straining your ligaments, and using a large muscle which is much better designed to cope with constant movement. You also click the mouse with your thumb, which again is much stronger than your fingers. Give it a go, I promise you’ll like it even more than the one you bought!